Portraits of Depression, by Jack Lane. Early June, 2016. A passing visitor on the ground floor of Building 160 would have been greeted with a sight similar to this. Dark canvases line the walls, each showing a portrait and lines of poetry in white. It doesn’t take long to realize that the pieces are about mental illness- depression in particular. The careful lines of verse communicate not just symptoms of chronic depression (eg. early morning wakening, psychomotor retardation, loss of appetite) but also individuality made more prominent by the faces in black and white guarding each poem. It's rare that we get to appreciate the value of art in a medical context. A thorough dig into psychosis literature (everything from the Schneiderian first-rank symptoms of schizophrenia, a set of symptoms recognized and used by physicians worldwide, to acts of madness in King Lear) reveals that one of the biggest challenges of understanding any type of mental illness, and psychosis in particular, is finding the ability to empathize. Cross-culturally, people who are "mad" are ostracized, whether they're living in suburban America or pastoral Masai society- where hearing voices is considered a normal part of religious rituals but hearing voices at the wrong time leads to social exclusion. The first layer of enigma in mental illness comes from an inability to understand why the idea of a needle in a haystack would incur "excruciating terror" (Autobiography of a Schizophrenic Girl by Marguerite Sechehaye) or what exactly it means to feel as if you are "being undone" (Dementia Praecox by Emil Kraeplin). Art and literature give us a valuable chance to recreate the inexplicable. The power of artistic expression is evident when we look at the work of some of the best poets, painters, and writers who also dealt with mental illness. The work of these artists who are better than most at expressing intangible things through unconventional means has much to tell us about the un-describable nature of mental illness. 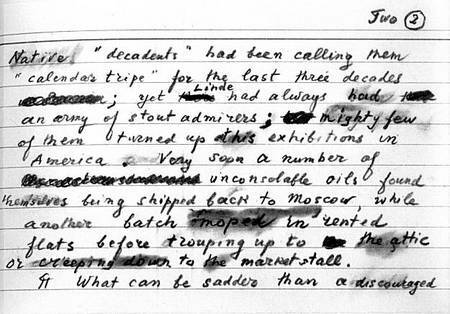 Vladimir Nabokov experienced synesthesia and mild hallucinations. Sylvia Plath likely had manic-depressive disorder. Ezra Pound experienced a psychotic break that led to the writing of his Cantos. Vincent van Gogh experiences recurrent psychotic episodes and bouts of severe depression. What do these artists help us learn about the horror and heartbreak of mental illness? It can be tempting to ascribe a causal effect between the two- to say that madness, to some extent, creates genius (Plato's Phaedrus described madness as "a gift of the gods"). But that simplified view is one that too quickly dismisses the reality of mental disorder. It becomes easy to romanticize mental illness and forget that experiences of depression, schizophrenia, and bipolar disorder are biologically and emotionally destructive. That there is no silver lining in being gripped with unexpected terror at any moment of the day. That there there is nothing romantic about being too catatonic to take part in things that once brought joy. The value of these artists is in how specific works can help us understand what would otherwise be beyond our reach. In "On Being Ill," Virginia Woolf describes the potency of illness as a literary theme and questions why it has not been explored as often as it ought to be. Beyond neglecting to explore illness in a literary sense, English fails to provide a vocabulary that serves to describe illness in all its fullness and complexity. language at once runs dry. and the hero become a white liquid with a sweet taste—"
It's the expression of illness or mental un-wellness itself that can serve a healing purpose. Art (whether that takes the form of writing or painting or making) can be an outlet to express the typically un-understandable, sensations and experiences that we have no words for. The use of art as healing can be seen through the extensive Prinzhorn Collection, a collection of artwork from patients of the Heidelberg Psychiatric Clinic curated by Hans Prinzhorn. The tensions reflected in Prinzhorn collection paintings express patient experiences in ways words cannot, and the therapeutic potential of art as part of the healing process is evident in that "art has become an integral part of psychiatric care." The ability for art to create a glimpse into an experience that is otherwise difficult to understand has incredible power. Whether in the form of a painting from a psychiatric clinic or a portrait series investigating depression or a short story that captures the irrational fear that tinges psychosis, art as a tool for empathy can help people understand mental illness in a way that is both enlightening for viewers/readers and therapeutic for the artist. Perhaps expression itself- being able to communicate an experience that feels innately, painfully personal- is an essential part of healing. Perhaps being able to make someone else understand and empathize is part of becoming well. Article was originally published June 2016 on inaweofdust.wordpress.com. Edited for Probe Magazine.